President Donald Trump said he will walk out of future press briefings if reporters do not act with “decorum” and refuse to follow the rules. 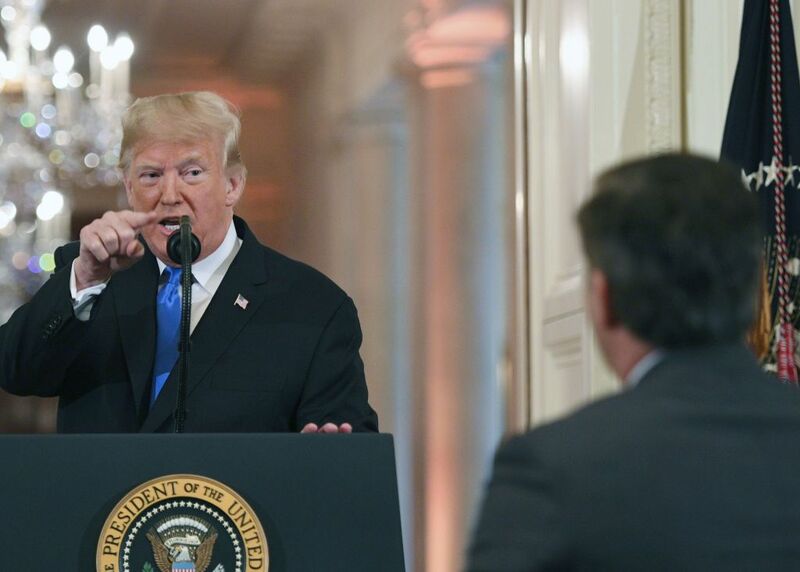 Trump was speaking following a court order compelling the White House to reinstate the press credentials of CNN’s Jim Acosta. Acosta had clashed with the president at a press briefing on November 8, and in justifying the decision to bar him White House Press Secretary Sarah Huckabee Sanders alleged that Acosta "placed his hands" on a White House female intern who tried to take his microphone away. The White House had used doctored footage taken from conspiracy trafficking site Infowars to falsely show Acosta pushing away the intern. CNN, in a lawsuit, alleged the White House had violated Acosta's First Amendment and Fifth Amendment rights. Trump shrugged off the court ruling Friday, claiming it was not not "a big deal". He said that reporters at press briefings would have to follow a set of rules being drawn up, including sticking to a set number of questions. "You can't take three questions and four questions and just stand up and not sit down," he added. "Decorum. You have to practice decorum." In a statement, Huckabee Sanders echoed Trump's emphasis on "decorum." "In response to the Court, we will temporarily reinstate the reporter’s hard pass. We will also further develop rules and processes to ensure fair and orderly press conferences in the future. There must be decorum at the White House," she said in a statement. The clash between Acosta and Trump is the latest in an escalating series of confrontations between the president and news networks he has branded "fake news" and the "enemies of the people." Trump in October blamed media hostility for a series of parcel bombs sent to CNN and prominent critics of his administration. CNN President Jeff Zucker remarked at the time that there was a "total and complete lack of understanding at the White House about the seriousness of their continued attacks on the media." On Twitter, White House correspondents expressed surprise at the president's new-found emphasis on decorum, citing his past abuse of reporters at briefings. U.S. District Judge Timothy Kelly, who is hearing CNN’s lawsuit challenging the revocation, said Acosta’s credentials must be restored while the network’s case is pending. In its lawsuit filed on Tuesday in U.S. District Court in Washington, CNN said the White House violated the First Amendment right to free speech, as well as the due process clause of the Constitution providing fair treatment through judicial process. The network asked for a temporary restraining order. Its lawsuit was backed by other news networks, including conservative Fox News. Judge Kelly, a Trump appointee, did not address the First Amendment’s protections for freedom of speech and the press, focussing instead on the due process provision. “Whatever process occurred within the government is still so shrouded in mystery that the government at oral argument could not tell me who made the initial decision to revoke Mr. Acosta’s press pass,” Kelly said in his verbal ruling. In court, U.S. government lawyers said there was no First Amendment right of access to the White House and that Acosta was penalized for acting rudely at the conference and not for his criticisms of the president.